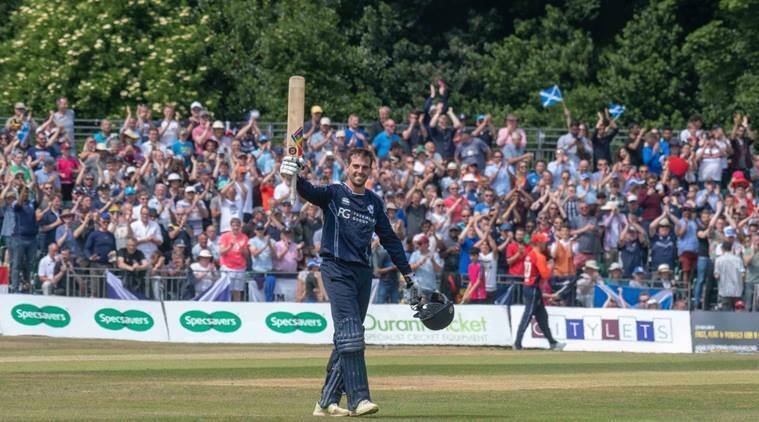 Scotland's Calum MacLeod created history after he became the first batsman from Scotland to score a hundred against England. Scotland’s Calum MacLeod created history after becoming the first batsman to score a hundred against England at the Grange Cricket Club, Edinburgh on Sunday. Macleod’s 100 which came off just 70 balls was also the fastest ODI hundred by a Scottish batsman. The 29-year-old right-handed batsman remained unbeaten on 140 as Scotland posted a mammoth 371/5 in 50 overs in the only ODI between the two sides. Incidentally, Scotland went past the 350-run mark for the first time ever in one-day internationals. MacLeod’s seventh ODI hundred was a blistering knock which featured an astounding 16 fours and three huge sixes. After reaching his fifty at less than a run-a-ball, MacLeod reached the three-figure mark in the 44th over when he ran a quick two off Adil Rashid. MacLeod was ably supported by middle-order batsman George Munsey who also brought up his maiden ODI half-century scoring 55 runs off 51 balls. Together the duo forged a hundred run stand for the fifth wicket which put Scotland in the driver’s seat. Earlier, Skipper Kyle Coetzer, who opened the innings, also hit a brisk 58 off 49 to set up the platform for Scotland’s total. Meanwhile, if England, who are without the services of Ben Stokes and Jos Butler can chase down this total then it will be joint second-highest successful ODI chase of all time. Scotland: Kyle Coetzer (capt), Richie Berrington, Dylan Budge, Matthew Cross (wk), Alasdair Evans, Michael Jones, Michael Leask, Calum MacLeod, Preston Mommsen, George Munsey, Safyaan Sharif, Chris Sole, Stuart Whittingham, Mark Watt, Brad Wheal. England: Eoin Morgan (capt), Moeen Ali, Jonny Bairstow (wk), Sam Billings, Alex Hales, Liam Plunkett, Adil Rashid, Joe Root, Jason Roy, Ben Stokes, David Willey, Chris Woakes, Mark Wood.